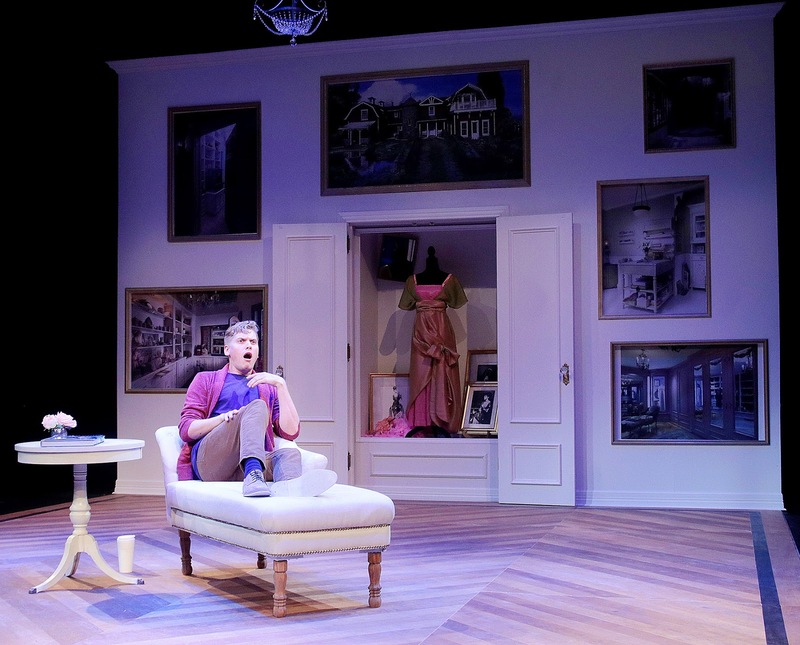 Main Street Theater's "Buyer & Cellar"
Main Street Theater continues to put on a wide range of intriguing shows; the latest, which opened yesterday, is Buyer & Cellar by Jonathan Tolins. In this one-man, one-set, one-act play, a struggling actor named Alex (Doug Atkins) accepts a job maintaining a small faux shopping mall in the basement of (one of) Barbra Streisand's house(s). There he weaves by night and day, a magic web with colors gay .... whoops, sorry, that's Tennyson, not Tolins. There Alex waits, dusting antique dolls and maintaining a frozen yogurt machine in the hopes that the elusive Barbra, his only potential customer, will visit. When she finally does, the two form an unlikely connection, but does Barbra consider Alex a friend, or is he simply an employee whom she uses to alleviate a loneliness to which she barely admit? This is an odd play. It's ably narrated by Atkins, who reminds the audience at the beginning that the story is fiction and then tells it like it's real. The setting, at least, is based in reality; Streisand's book My Passion for Design, published in 2010, gives a photographic tour of her estate, including the basement "street" with Bee's Doll Shop, an antique clothes shop, a gift shop, and more. Alex relates his encounters with the diva, his own thoughts and insecurities, and his exchanges with his boyfriend Barry, who grows impatient with Alex's tolerance of Barbra's selfish idiosyncrasies. To be completely honest, I struggled a bit with this play -- not with Atkins' performance or MST's production, but with the play itself. It's laugh-out-loud funny in several places, and its point that successful people are often very lonely and insecure is well taken, but somehow I didn't find it quite funny or quite touching enough to justify itself. I couldn't help wondering: why write a play about this? What is here, other than the novelty of the set-up, that is funnier or more profound than what can be seen in other comedies with similar themes? It took me a little while to figure out what I was looking for in this piece, but then I recognized that what I wanted was the same funny/moving experience I got from watching the film The Adventures of Priscilla, Queen of the Desert. And then I recognized that that was somewhat arrogant of me -- at least, I think arrogant is the word I'm looking for. Buyer and Cellar and Priscilla are not about the same thing, so demanding that one be like the other is unfair. In the end, I'm glad I saw this. It made me think, not just about its own content but about the creation of art, and the act of deciding what art can or should be based upon. I once wrote a fantasy short story about squirrels, for instance, and one friend's reaction was "you're really going to waste magic on squirrels?" Hell, yes! I love squirrels. And judging from the reception that Buyer & Cellar received for its 2013 New York debut, and the number of places it's since been performed around the country, clearly a lot of theater goers find what they're looking for in this play. Playing July 14 through August 12, 2018; tickets here.